Dental implants are the natural looking and feeling replacement for missing teeth. Dental implants will reproduce the look of your natural teeth and are able to replace single, multiple, or a whole row of lost teeth. 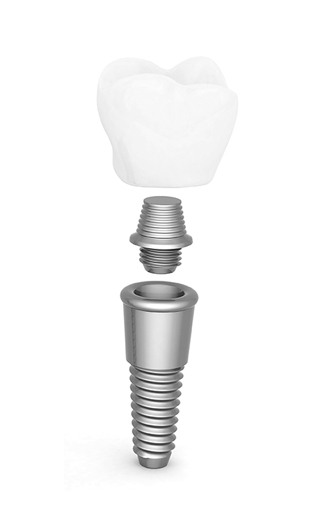 Implants are made up of three components: a titanium post, an abutment, and a crown. A titanium rod is attached to the jaw bone and acts as the root for the missing tooth. Titanium is biocompatible and can integrate successfully with the bone in the jaw, creating the foundation strong enough for the other components of the dental implant. An abutment attaches securely in place to the post, sitting right above the gum line. The abutment connects the post of the dental implant with the crown. The crown is the only part of the dental implant that remains visible and is colored and shaped to be identical to the surrounding teeth. The crown is then fixed to the abutment, which allows the crown to appear to be coming up naturally from the bone. Dental implants can also help to preserve comprehensive bone health. When the patient has missing teeth the jaw bone at that location begins to dissolve. Dental implants impede and halt the process by replicating the root of the missing teeth which stimulates the bones. WHY IS IT IMPORTANT TO REPLACE MISSING TEETH WITH DENTAL IMPLANTS? It’s important to realize that dentures do not slow down or stop the process of bone less in the jaw. If someone wearing dentures decides later to have missing teeth replaced with dental implants, it is possible that a bone graft be necessary as a result of a loss of bone. This is just another reason it is so important to replace missing teeth as quickly as possible. Dental implants require no extra care or maintenance and should last a lifetime. They look and function naturally, just like real teeth.